Rodbourne is a suburb of Swindon, Wiltshire, and sits nestled between the main east / west line and Gloucester & Cheltenham branch line of First Great Western, formerly British Rail before privatisation and originaly the Great Western Railway Company (GWR). The area was previously known as “Even Swindon” due to its location on the lower and flatter land 2km (c1.5m) north-west of the established town of Swindon. 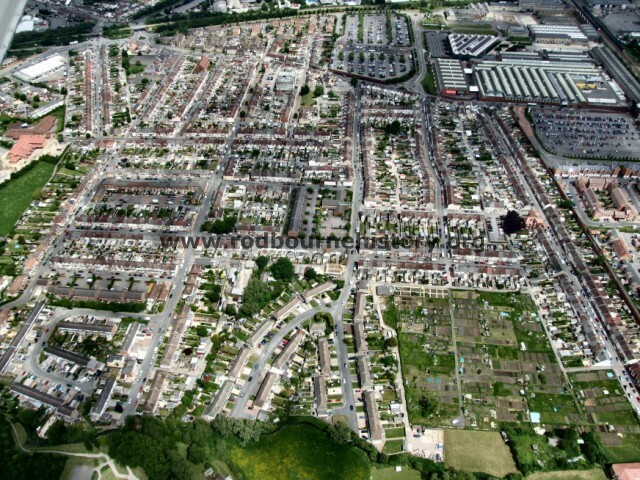 The manor of Even Swindon was first mentioned in documents written in the early 13th century, but over the years the area has taken on the name of the main road that passes through it; Rodbourne Road. Before the GWR works arrived Rodbourne Road passed through farm land. Things dramatically changed when housing for the GWR workers started to be built from the late 1870’s onwards. The development started with the erection of two and three bedroom terraced houses on roads either side of Rodbourne Road. Over the next 40years or so it expanded westwards in the grid pattern of streets clearly visible today. There have been several more recent changes to the layout of Rodbourne. William and Charles Streets were demolished to make way for sheltered housing. The closure of the GWR works has meant redevelopment of Rodbourne’s eastern and southern edges. Here you can find new housing, the Designer Outlet Village and headquarters for both the National Trust and English Heritage. 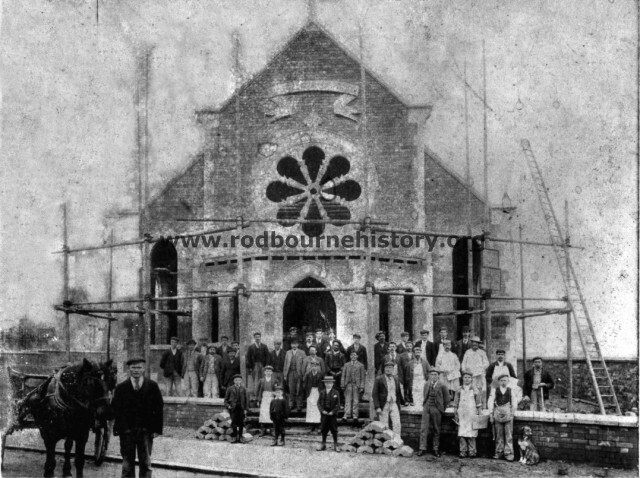 By the turn of the century the church was in a poor structural condition and it was agreed that the building should be pulled down and the New Hall be refurbished to a church building to accommodate the current needs. The last service was held on January 5th 2003. Mrs. Jones Allen was the preacher. The work was scheduled to start on 13 January 2003. The building was reduced to rubble and where the church stood is now a car park. When the work was complete the small dedicated congregation paired the building for its reopening. With all the cleaning done, everything back in place, the project was complete. This service of rededication of the newly reordered premises was held on June 8th 2003 at 3pm. The service was conducted by the minister Rev Janet Evans and the preacher was the Superintendent Minister Rev Derek Collins. Members from Rodbourne, St Andrews Moredon, Tony Attwood and members from St Augustine’s, representatives from the architects and Redstone construction all made contributions to the service. In true Rodbourne attrition the service was followed by most enjoyable tea. The building is an attractive one, it easier to maintain and less costly to run. The windows designed by Alex Mulhall and the gardens surrounding the entrance and car park add to its attraction. The sound of the GWR Works hooter reverberated around the Designer Outlet buildings on Friday morning at 8.15 thanks to the efforts of Graham Mack (BBC Radio Wiltshire) and a 20,000 watt speaker system. 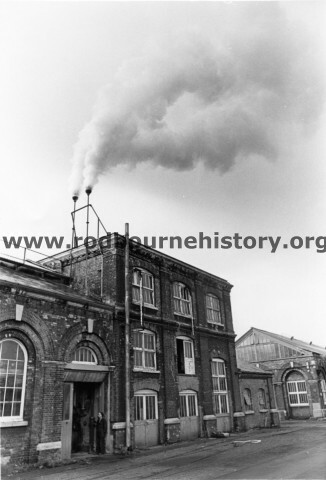 A small group including myself and RCHG member Ernie Fisher gathered round to witness the demonstration which was very impressive but unfortunately was muffled over Rodbourne as the speakers were at ground level.